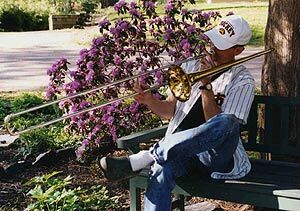 8-4-04 – When it comes to growing annuals, gardeners new to the hobby often fall into one of two camps. The first perceives annuals as a waste of time and money (“You mean you plant an entire garden full of them, then they’re all dead in November?”) and so choose to grow only perennials. The second perceives perennials as a waste of time and money (“You mean this plant costs seven dollars, blooms for two weeks, and takes three years to get big?”) and so chooses to grow only annuals. The most beautiful gardens I visit across the Twin Cities are created by gardeners who have learned that a blend of annuals and perennials is best. Annuals are essential to the creation of attractive landscapes because they bloom much longer across our growing season than do perennials (though it isn’t true that all annuals bloom all summer long). Annuals provide months of continuous color that remains constant while the flowers on trees, shrub and perennials comes and goes. Remember, however, that while color from blooms is dandy, it’s all about creating contrasts between the form of the plants and the size, color and shape of their foliage that makes for a beautiful garden. This is why savvy gardeners sway toward the relatively short list of annuals that have attractive leaves and stature to go with their colorful blooms. Light shade may be the most common exposure found from city to suburbs, and that suits Begonia just fine. This is a very large genus of extraordinarily beautiful plants. Nursery hybridizers always flog a good thing, but in this case the new varieties are wondrous. 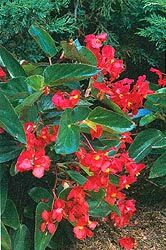 B. x hybrida Dragon Wing features rich scarlet to pink flowers that extend well outward from the oval, cupped, shiny green leaves. B. Rex Hybrids (rex begonias) grow 6-12” tall and 12-16” wide. 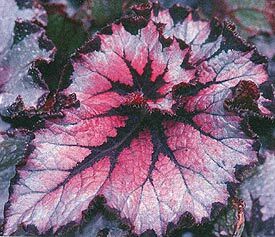 They are grown for their large, ruffled, multi-colored leaves, arresting blends of purple, burgundy, silver, magenta, green and pink. Old, reliable B. semporflorens (wax begonias) bloom all summer, rarely need deadheading, and let you mix and match white, pink or red blooms with green, bronze, or reddish foliage. 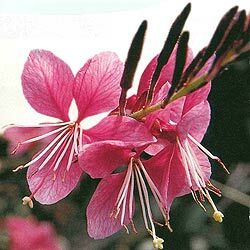 As interest in tropical and tropical-looking garden plants has grown, more nurseries are offering annual Gaura, and for those desiring the unusual it is well worth seeking out. Orchid-like, 1” flowers emerge from the top half of tall, narrow, branching stems from late spring through summer. G. lindheimeri grows 3-4’ tall with clean, paper-white blooms. Most striking is ‘Corrie’s Gold,’ more compact at 24-36’ tall with yellow variegated foliage and pink and white blooms. ‘Siskiyou Pink” has bright pink flowers. Plants need full sun are great in large containers and when combined with perennials in flowerbeds. 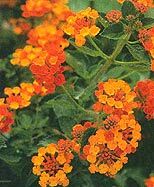 Lantana may be the best container annual of all; one couldn’t design a better plant for combining with other annuals in pots and window boxes. The 14” tall L. camara ‘Spreading Sunset’ explodes with large clusters of small flowers that bloom gold and orange on the same plant. Long, thin scapes hold the flower clusters well away from the central stalks, so that the very attractive, dark-green, mint-like foliage remains visible. The trailing L. montevidensis ‘Weeping Lavender’ mounds to 12” tall and produces slender, 30” stems with rich pink flowers that look spectacular tumbling down from flowerboxes. Full sun. 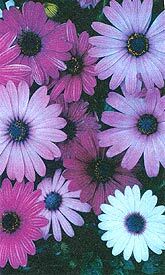 Of the many annuals featuring daisy-like flowers, Osteospermum (African Daisy) is my favorite. Most cultivars feature muted shades of color that give the plant a subtle elegance. O. Symphony Series was developed under the Proven Winners brand and are widely available at local nurseries. ‘Cream,’ ‘Lemon,’ Orange,’ ‘Peach’ and ‘Vanilla’ grow 15’ tall by 15’ wide and bloom heartily in full sun from June through September (with proper watering, deadheading, and bi-monthly fertilization, of course). They are perfect for containers as well as placed singly or en masse in flowerbeds. Full sun. Lynde Greenhouse & Nursery (Maple Grove/763-420-4400) continues to distinguish itself as a large, top-notch grower of favorite and standard annuals, but expands their pallet each year to include new and unusual genera and varieties. They were all over the annual grasses trend a good season or two ahead of most others, though for some reason they’ve decided not to grow Gaura this year. They may be devoting the space to something they like even better. Dundee Nursery(Plymouth and Savage/763-559-4016) has specialized in annuals for over 50 years, and it shows. Much depends on the expertise of the greenhouse personnel, in terms of growing conditions and how plants are started and cared for in the weeks to months prior to their being offered for sale. Expect to find high quality as well at Tonkadale Greenhouse (Minnetonka/952-938-6480). In the east metro, Linder’s(651-488-1927) always grows huge, healthy crops of a dizzying number of annuals, and Gertens (651-450-1501) is a sure bet for all of the above, plus several thousand additional varieties. DO prepare soil prior to planting by using a power tiller or turning and chopping soil with a shovel. Chop in fresh amendments such as peat moss or compost initially and every 3-4 years. I like to add a one-inch layer of compost on the soil in the fall, in the places I grow annuals, after ripping the annuals out at season’s end. DON’T select the tallest, largest, most flower-filled annuals on the table. The younger/smaller plants you purchase, the better. Check out Annual Disasters for the definitive treatment of this subject. DO be ready to plant within a day or two of bringing annuals home. If delayed, place all annuals in dappled shade and keep them watered. DON’T purchase and plant annuals too early. Let the soil warm up and frost warnings cease; on average, this means planting around May 10-15. Tropicals should never be planted before June 1 in Zone 4, and June 10 in Zone 3, no matter what type of spring we are having. DO use a sterile, bagged potting soil formulated for containers when planting containers. Empty containers and dump soil onto garden beds or the compost bin in fall, and buy new bags of soil for containers each spring. DON’T think annuals in garden beds and containers are maintenance-free. Regular watering, fertilizing, and deadheading (removal of faded flowers) are required for plants to stay healthy and look their best. Pop annuals into the perennial garden after the perennials have filled out, anywhere dashes of color are needed. It’s fine to plant an even number (2-4-6) if that’s how many are needed to fill the space. Grow annuals in inexpensive plastic containers then elevate them with bricks, toward the back of the perennial bed. Foliage from the perennials will hide the containers, creating the illusion that your coleus are 3-4’ tall. CG: How tight should I plant annuals when potting up my containers? RG: 2-3” spacing is best, but don’t hesitate to plant virtually root-ball-to-root-ball in containers that are 10” tall or more. Each plant will hammer out an adequate root zone beneath itself. 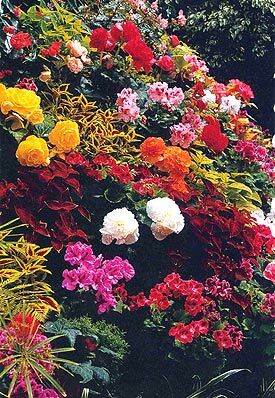 Annuals in containers grown in full sun will probably need daily watering, and all annuals benefit from bi-monthly fertilizing, no matter what the spacing, and with this regimen they’ll do fine even in cramped quarters. CG: How tight should I plant annuals in the garden bed? RG: Tighter than most people plant them. Ignore the spacing directions on the plant tags—those are for Texas. In garden beds, ram your annuals close together, on average 2-3” closer than the plant tags tell you. We have a short growing season. You want your annual plantings to fill out and hide the soil by the end of June, not August. CG: If I mix in some perennials in my planters can I plant the perennials in the ground and reuse them next year? RG: Certainly, and that’s a very good trick. You’ll need to remove the perennials from containers in early September and get them back in the ground, and watered in well. Don’t fertilize. It will be wise to cover those fall transplants with bags of leaves or 12” of marsh hay in December, after the ground has frozen. Meanwhile, back to September and the containers you just tore a part, buy some fresh mums and plant those to carry the containers through fall. CG: Do I have to have a tropical garden to include tropicals? RG: No, but to quote my favorite witch, these things must be handled delicately. One tropical plant in an otherwise traditional garden will be difficult to keep from looking odd, but if my eye can pick up the same plant and two or three other tropicals as I scan the scene, it can be spectacular. You can grow tropical-looking perennials (Ligularia, Lobelia, Dicentra, Lilium, Alcea) and annuals (Brugmansia, Amaranthus, Diascia, Gaura) to help tropicals fit in. CG: My annuals look so leggy and ugly around August. What should I do?